Installing OpenStack is quite difficult, specially for the people who is not really into basically most of IT topics. In my attempt to get started, and after searching for the easiest way to install OpenStack, I ended up writing my own automated tasks in BASH, and at some point I decided to generalice those scripts a little bit more and release them to the community. 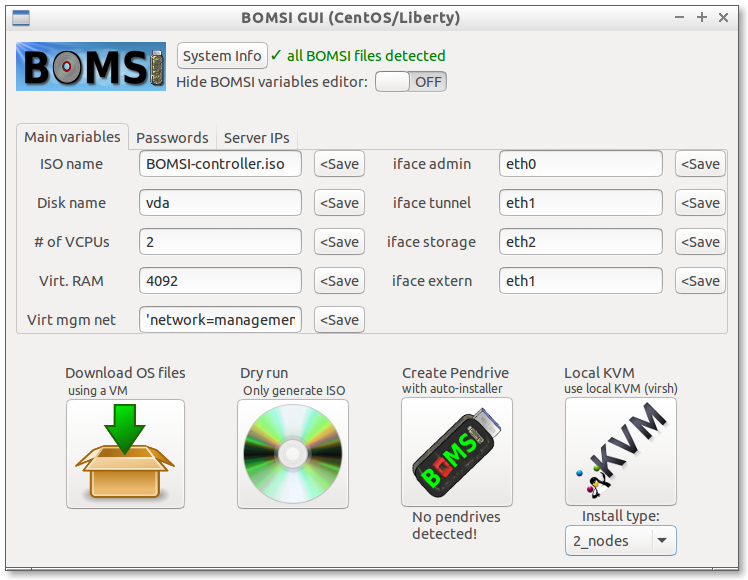 BOMSI follows the official install guide at OpenStack Docs for CentOS7, and it does it in plain BASH, so it is easy to understand whatever is going on during the installation, and easily improve it. It’s GPL v2 license, so you are all very welcome to contribute on GitHub repository. … and that’s it. In some 15 minutes a horizon dashboard will be waiting for you at http://10.0.0.11/dashboard. For generating the 3 node virtual environment it is recommended that have 8 or 16 Gb of RAM, a i5 or i7 processor (or equivalent) and some 20 Gb of free space on the hard disk, to host the KVM virtual machines. Ideally the computer should be running Ubuntu, but it should work somehow in other GNU/Linux distributions. Furthermore, being aware that some people prefer graphical user interfaces (GUIs) to work on the configuration files and execute the options, I also added a very simple GUI. If you are OK with the default options, just click on the “Local KVM” square button and wait for some 15 minutes. That’s it. So… 3 commands, or 3 commands and a click, isn’t this the easiest way to install OpenStack at the moment? This entry was posted in bash, Cloud Computing, IT, OpenStack, Operative Systems, python and tagged BOMSI, GUI, Installer, OpenStack on December 14, 2015 by larrucea.